shooting pain down the leg. 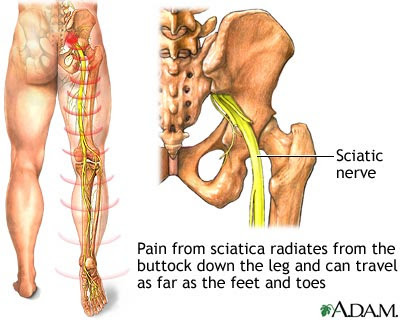 Sciatica is the sensation of pain,tingling,or numbness in the buttocks and/or legs produced by an irritation of the sciatic nerve, which branches as it descends into the buttocks and down each leg to the ankles and feet. The primary cause of sciatica are herniated, bulging, or degenerated discs,which induce pressure on the spinal nerve roots. Other causes include small,bony growths on the spine (bone spurs) or compression of the nerves through injury. In rare cases, the sciatic nerve may be irritated by conditions such as tumors,pregnancy, or piriformis syndrome. We utilize a integrated approach to eliminate not only the pain, but the cause of the problem. Spinal decompression using the DRX 9000 NYC,Cold laser therapy,Cox flexion distraction,Kinesiology tape, Pain Management. Labels: leg pain pinched nerve sciatica sciatica nyc shooting pain down the leg.